This article is an expansion on a previous essay. It will discuss the different types of armor materials, and cost-benefit analysis' that should be done before considering a purchase. There will also be some attention on the complex reasons why certain armor systems can be good in one role and poor in another. What is the best armor material? This is a question that has been argued to death on every conceievable forum, from youtube to military blogs to the armor industry itself. However, this question has several issues itself, mainly the fact that there is no super material suited for all applications. 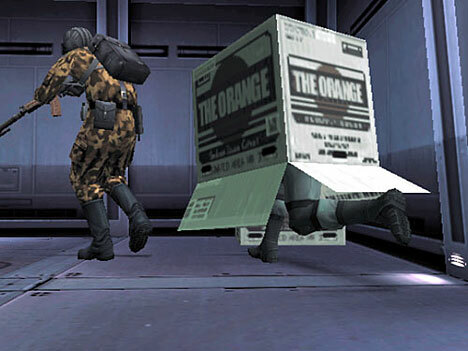 Depending on use, armor materials can be selected to minimise weight, cost, and volume, while offering protection from a specific projectile. Police generally want light-concealable vests that are effective against handguns, while soldiers look to systems which are heavier and bulkier, but offer protection against rifles. While many people (especially those in harms way), would prefer to ignore the role of cost, it is a very important consideration. There are a plethora of materials available, and even more production techniques: In the end, both of these are subject to the amount of money a company wants to spend. Putting cost aside for now, we will examine the basics of armor materials and how they are fit to various applications. There are four general categories of material that one can use to classify and begin to characterize armors by: Metals, Ceramics, Polymers and Composites. Once assigned to a category, you can begin to make some generalized assumptions about the armor. For instance, ceramic armor will always be brittle due to structure effects inherent to ceramics, such as a low number of slip planes and high dislocation movement energy. On the other side, polymers are typically used because they have high plastic strain abilities (not exactly the case for polyaramids like Kevlar) and high multi-hit capacity. Metals are a vast category which can really span either side of this, an annealed steel may offer high multi-hit capacity at significant strains whereas the same steel quenched to form full martensite may shatter on the first hit. Composites are hard to generalize due to the high variance of reinforcing methods and materials but this category usually contains MMC, CMC, FRP and FRR . So if ceramics are so brittle, why does anyone use them? The answer to this question can be given by three properties: Weight, hardness, and energy dissipation. While it is true that ceramic plates undergo significant cracking after taking a hit, this is an anticipated effect and is actually one which saves the wearer from serious harm. The cracking of ceramics is a multi-step process which begins with cracks creating a plug . This plug cannot leave the armor due to the backing on the plate, and is pinned in place to act as the impact interface for the bullet. 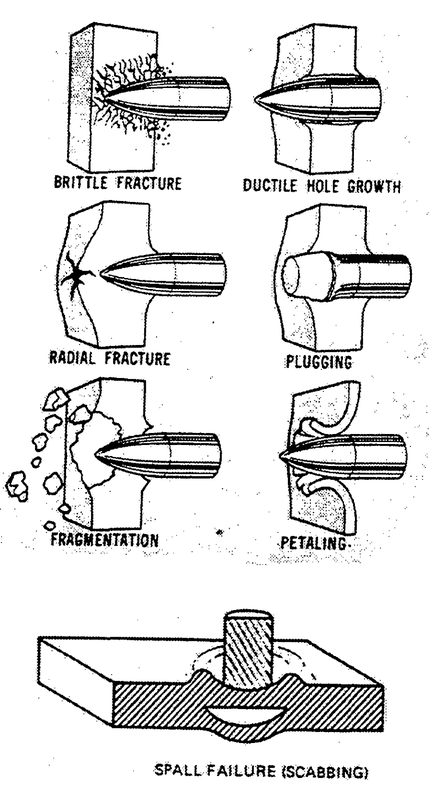 During this interaction, the plug fractures to smaller and smaller pieces due to the extreme internal forces which dissipate energy from the bullet. However, even more energy is dissipated by fracturing outside the impact site, hence the massive cracks and seemingly large impact area on a ceramic plate. Without this extensive cracking energy, the bullet would remain focused on the impact interface and could potentially move through the back of the armor to perforation. This type of energy dissipation coupled to the low weight and high hardness required to deform hardened penetrators is something seen only in ceramics. Polymer armors are evolving to reach extremely high energy dissipation abilities but many of these systems still cannot stop the standard M2 AP required for NIJ Level IV certification, because they cannot deform and slow down such a large hardened projectile before perforation occurs. Metals can accomplish this but generally not without a large weight or volume penalty which is why ceramic mass efficiency can be as high as 3 times that of RHA (rolled homogenous armor). So with so many trade offs and properties, how do you choose the right material? As stressed before, that is a question that is entirely dependent upon application. We can use body armor (a relatively hot topic) to case study the way these various materials have been implemented. To start off, lets review some armor designs starting with plain woven vests. For obvious reasons we can define a plain ballistic vest as nothing more than a cloth vest rated to stop a range of projectiles, typically handgun rounds. Vest materials in the past were high strength cottons and silks but are now Kevlar, UHMWPE, or mixes of these two. For a brief period of time another polyaramid known under the trade name Zylon was being used, but after environmental failures were observed the material was banned by the NIJ. The structure of such vests are successive layers (30 to 40) of fibers in a tight 0/90 weave . This design is reasonably flexible and acts as a super strong net for projectiles. The physics of this design can be broken down into a few easily explainable ideas. Kevlar is strong in the lateral and longitudinal direction, therefore, Kevlar vest requires a certain level of “give”. This is in regards to the properties of the fibers themselves, as they are strong in tension but not shear, so to utilise their strength, they must be able to flex or else they will be cut. Therefore when a bullet hits a vest, that portion of the vest is pushed back since it is not rigid, which allows the weave to reorient stress directions so that the majority of the fibers involved are being pulled and only a small area if actually being pushed against or sheared. Resistance from these tensed fibers is what slows the projectile, and even with their enormous tensile strength, quite a few layers of Kevlar will be sheared before the bullet is arrested. This brings up the second idea which is effectiveness related to the applied shear stress. This issue manifests in several ways mainly velocity, bullet tip radius, and bullet material. The effect of velocity on applied shear should be somewhat obvious, higher impact velocities create higher interface stresses and higher shear stress means more fiber cutting, it also means fibers have less time to move so cutting can actually be further enhanced since there is less reorientation to the more favorable tensile direction and less material is engaged at faster events. Bullet tip radius defines the shear zone and larger radius bullets will create softer curvature for fibers and therefore decrease the shear stress. Bullet material also plays a large part in this: As can be seen on several Youtube videos of slow motion impacts into woven Kevlar, a bullet can experience a significant amount of plastic deformation or mushrooming during impact. This plastic deformation in a vest cannot be determined by the low strain rate generalization that a softer material will deform against a harder material since obviously most bullets are harder than Kevlar or UHMWPE . So what is the cause of this deformation? Well it relates to the flow strength in the bullet and the deceleration at the impact interface. When the bullet, which for a handgun can be going in excess of 425 m/s, hits the vest there is a rapid deceleration of the front of the bullet at the impact interface. However at high strain rates a projectile cannot always be modeled as perfectly rigid as is done in quasi-static loading. Instead one must account for a velocity difference between the front and back of the bullet, if the flow strength of the bullet is low enough (lead core, soft annealed steel, or copper) then the bullet will mushroom out, as the back of the bullet applies a compressive force toward the front due to its higher velocity. As mentioned earlier, mushrooming increases the effective bullet radius which can lower the applied shear stress and engage more fibers. But not all materials will do this, particularly hardened core penetrators such as hardened steel or tungsten carbide core bullets. This is one of the reasons why a bullet of the same caliber and roughly the same velocity will have a different effect on a vest depending on whether it is lead core or AP. The next stage of body armor, the hard plate, was developed in answer to the soft vests inability to stop rifle rounds for the reasons mentioned above (higher velocities and generally sharper ammunition). In early development, these consisted mostly of steel plates but have since evolved to include a somewhat extensive number of materials depending on the desired protection level. This is commonly where the debate between metal and ceramic comes into play as many people don’t like the lack of toughness associated with ceramic materials, however it is important to remember the positive properties of ceramics such as lower density and high hardness for increased efficiency against AP rounds. For the highest level of protection, level IV, a plate must stop between one and six rounds of M2 AP at 10 meters distance: At present, the only NIJ certified level IV plates are ceramic. The requirements are so stringent that polymer based hard plates can't make the cut. Although some companys advertise their plates as level IV after some distance (100 meters, 200 meters, etc), this is not an official NIJ certification and seems to be little more than a marketing ploy, as even a cardboard box could be level IV at a great enough distance. To their credit, though, polymer plates are the lightest of the hard body armor, and have excellent multi-hit capability though this comes with an increased plate thickness. Metal plates for body armor are either steel or titanium with the only advantage of titanium being its somewhat lighter, although both are heavier than ceramic and polymer plates. Another important aspect of these plates is the back face deflection, for which ceramic and metal plates require some kind of trauma backing. Ceramic plates are almost always backed by composite FRR layer whereas metal plates are usually sold by themselves so while they appear less bulky at first glance, the addition of a trauma plate equals out the thickness difference. Many composite plates are produced in the same manner as ceramic plates and are generally not sold without reinforcement. So to decide which material is better requires defining certain operational parameters that really depend on expected use. Although some companies have boasted level IV ceramic plates that have multi-hit capacity of six shots (whereas military regulations require just three), these plates are still fragile and can become compromised if dropped or used incorrectly. 1. MMC is metal matrix composite. CMC is ceramic matrix composite. FRP is fiber reinforced plastic, this really includes any type of fiber used, common ones are carbon fiber, glass fiber, aramid fiber, and in some cases metal fibers. FRR is fiber reinforced resin, a term applied to fiber reinforcements in materials such as epoxy or urethane. 2. Plugging is when a section of material in front of a penetrator becomes separated from the bulk by internal free surfaces caused by shearing. Can be imagined as a free cylinder being punched out in front of the projectile. 3. 0/90 refers to a convention in composite engineering for defining how things are oriented, in this case 0/90 basically means there are fibers going horizontal and fibers going vertical so 0° and 90° or perpendicular fibers. This definition is important since layered structures can be very complex such as 0/45/-45/0. 3. The technical name for UHMWPE is ultra high molecular weight polyethylene. Essentially, its a form of polyethylene with extremely long polymer chains resulting in an increase in tensile strength do to the forces associated with chain sliding resistance such as friction and van der waals forces. Sold under the trade names spectra and dyneema.